RFID has been a big buzzword lately for anyone who is interested in any type of item identification. Up until now, the trusty barcode has been the identification tactic of choice and has served many businesses for decades. However, RFID continues to grow as a possible alternative. While RFID may not be a suitable replacement for barcodes in all situations, it does offer some advantages that you may want to take advantage of for your business. Implementing RFID in your business is more complex than using simple barcoding, but we’ll help you learn what you need to know to get started. Do you need non-line-of-site reading? What are the required read ranges? Will you need to just read and process RFID tags or create them as well? Do you need serialization for each item? Will the item be traveling or fixed when read? How fast will it be moving? Does the item contain metal in its construction, outer surface, or packaging? What environmental factors will the RFID tag encounter? Water/rain/snow/fog? Will your application use fixed or mobile readers? In the following, we’ll review the basics of RFID and all the components that make up an RFID system. Going through these points and the questions above will help you determine if RFID is a suitable and feasible solution for your Auto-ID tracking needs. Before getting into all the parts of an RFID system it is best if we look at some of the basic principles behind the technology itself. 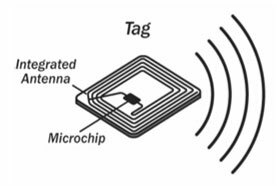 High Frequency RFID operates at the 13.56MHz range and has a short read range of about 5 inches normally but with specialized readers and larger tags you can reach almost 3ft. HF RFID tags have fewer interference issues than UHF so while their range is limited they are a good solution for small object tagging on automated lines. High speed reading is also possible which has made HF a good option in healthcare environments where small vials and samples need to be read. Ultra High Frequency RFID operates between 902-928 MHz in North America and has read ranges up to approximately 10ft. UHF has become the most used option in Auto-ID applications due to its long read range and dropping costs. UHF does have more issues with interference but a well-designed system can overcome these issues. UHF RFID is also well suited to mounting on label stock making it the perfect item/container level tag option. Regardless of the frequency range, RFID systems can either be passive or active. This difference is referring to whether the RFID tags themselves have their own power source (a battery). Active tags are quite a bit more expensive and will normally be physically larger. If you have an electronic toll-pass you are using active RFID. Since they have their own power source, active tags have much further read ranges and can be read at high speeds. For Auto-ID purposes, passive tags are the most common since you can create tags that are thin enough to be labels and cost only around $.10 to $.20 instead of $25 to over $100. With a passive tag, the reader actually powers the tag which then sends back its data to the reader. Everything we cover in the following will focus on passive UHF technology since it is the best fit and most widely used to track products. With a passive UHF system, you have 4 main components: the tag, antenna, reader, and host PC. The reader is scanning each antenna attached to it so that once a tag enters the field of one of the antenna it is first powered up. Once fully powered, the tag “backscatters” its information which the antenna can then pick up. This is the most delicate part of any system since this is where interference comes into play. Liquids absorb the projected signal while metals will reflect it. Depending on what you are labeling, where the tag is placed, and how many items you are trying to read at once, the performance of any system will greatly vary. In the cases where the tag is powered and read properly, the data on the tag is processed by the reader and sent onto your host PC. On your host, you would be running some type of software to then put the read tag information to use. This could be an asset tracking software, an inventory management system, or even an event tracking application. Like barcodes, RFID tags are a simple identifier but the tags can be read faster and automatically without line-of-site or orientation concerns. Since each tag will have a unique number on it, the ways you track items will only be limited by your needs and software capabilities. While it may seem like the perfect technology at first, RFID does have its limitations. We’ve already covered several of its issues with interference, especially when dealing with liquids and metals. The truth is though that almost any type of material could limit the accuracy and range of an RFID system. A palate full of non-metal/liquid products could still have issues since with a dense collection of items, those in the middle of the palate may never receive enough antenna signal to ever power up. While it would be great to just push a button and read every RFID tag in your building, the technology is still not quite there yet. Reading individual or smaller collections of tags is your best bet to ensure 100% read accuracy. Many distribution facilities that use RFID will first just read a signal tag for the entire palate when it arrives and the break out the palate to capture the individual items. The main point to take from this is that RFID technology is much more susceptible to the environment it is being used in than a barcode system. A proper site survey and extensive testing are always a must when implementing any RFID solution. Knowing where to place tags, how they will be scanned, and what the products are will all have to be taken into account when designing any system. Getting many of the advantages of an RFID system will depend on organizing your system in the right way. Now that we have covered some of the basics of RFID we can start looking in detail at the specific components every system will have. As mentioned before, choosing the right components will depend heavily on how you’ll be using RFID and the type of items you are trying to read. Every system has to start by selecting an RFID tag that will perform well given your reading requirements, size constraints, and application type. A tag consists of two parts: the chipset and antenna. The chipset stores the unique data for the tag determines the amount of information it can store, and the available security features. The antenna allows the chip to receive power and transmit information. Normally, the larger the antenna the better range you will get. There are a variety of chipsets and antenna designs which are designed to perform in all types of applications. While there is no single cure-all tag, the Alien Squiggle UHF tag works well in many environments due to its large antenna. This does mean that the tags are always around 4″ wide though. While these tags are all paper-based labels there are also hard tags that are in a plastic enclosure for more rugged environments. To find the right tag for your application you will ultimately want to test several designs and placements to determine the best performing chipset and antenna. Once you’ve found a suitable tag to use in your application you’ll want to get a printer to encode them. A dedicated RFID printer makes encoding tags easy and allows you to also print barcodes on the label as well. You may ask why you would want to use barcodes along with RFID. The printed information can be additional information not available in the RFID part of the tag but also provide a redundant failsafe in case the tag gets damaged. Using barcodes and RFID together ensure that no matter where the tag is being used, the data is always accessible. Choosing a specific printer will ultimately come down to the volume of tags you will be making. There are small volume printers like the Intermec PC43t to rugged, high-speed models like the Zebra R110Xi4. The added benefit to a dedicated RFID printer is that it is also a general label printer as well. You are really getting 2 devices in one. RFID readers are available in 3 different styles depending on how you will be collecting data. Fixed readers are used to create portals for automated reading. With a fixed reader, you will normally have 2 to 4 antennas attached to it to read tags as they pass by. This type of reader is most commonly used to read tags as they enter a room, pass through warehouse dock doors, or travel on a conveyor line. 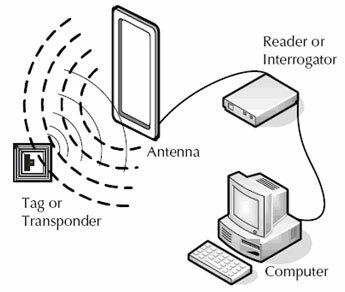 The reader itself will be connected to a host PC or your network to transmit all of the tag data. Since these readers are normally used in automated applications they normally have additional connections to support external presentation sensors or light stacks to notify users of completed reads. The Impinj Speedway Revolution is an example of a fixed reader that supports 4 antennas designed for industrial applications. Mobile RFID readers are the same as a standard mobile computer but with the addition of an RFID antenna and reader. These types of readers are made for manually reading tags on the move and will also have barcode scanning capabilities. Being a mobile computer, models like the Motorola MC3190-Zare the perfect tool to conduct RFID based asset tracking or inventory counts. All of the scanned RFID data can be used in software running locally on the device or sent on to a larger system through a wireless network. Many RFID installations will use both fixed and mobile readers. For applications that need a reader right next to a PC for easy input, there are some devices that act similarly to a basic barcode scanner in that they will output simple keyboard data. Fixed and mobile readers will not be so plug-and-play. Desktop readers are always connected to a PC and with their included software you can input RFID tag data into almost any application. Since these devices are made for desktop usage, they have very short read ranges of maybe 12 inches at max. For quick and easy reads, desktop readers like the Motorola DS9808-R are your simplest solution. Middleware is the software that will put all of your RFID tag information to some specific purpose. As stated before, this may be an inventory tracking software, asset management system, or any other type of application. The key point to remember is that an RFID tag has quite a bit more information than a barcode and RFID readers (except desktop models) do not output basic keyboard text data like barcode scanners. Whatever application you end up using, it will specifically have to support RFID readers. Fixed and Mobile readers have a language that they use called Low Level Reader Protocol (LLRP). LLRP is a standardized protocol that any application can use to support RFID readers. In the case of some mobile readers, the manufacturer may have a built-in conversion application that uses LLRP to then output keyboard text like a scanner. This is not often the case so you should always ensure that your middleware application will support LLRP and RFID readers. Through this overview, you’ve learned some RFID basics and the core components of any system. RFID technology can be a very powerful tool in a wide range of applications for all types of businesses but you’ve also seen that it is not an out-of-the-box solution either. Every RFID installation is unique and requires plenty of planning and testing before any final decisions are made. In many cases, businesses will start with a limited install of an RFID. They start with a single portal or only a few mobile readers. As the testing process and pilots develop, it’s then possible to deploy a system at larger scales. Finding the right RFID solution is always a challenge and having the right resources and help are critical. If RFID sounds like a suitable solution for your business or you have additional questions, feel free to call our experts – we’re always happy to help you find the right solution for your needs.